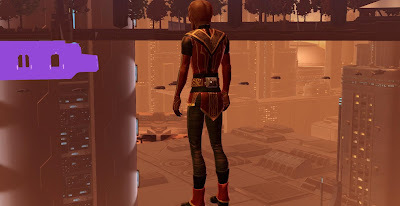 Last year I wrote a series of posts about establishing a new legacy on the Progenitor. That project kind of came to an end when KotFE came out, since I haven't really been back to that server since then. I think I left my agent just as she was supposed to go to Hoth. Need to get back to that some time, if for no other reason than to finish the agent story a second time! Either way this didn't stop me from founding yet another legacy on another server last week, this time on the US East Coast RP server The Ebon Hawk. While PvPing with Traitine he mentioned that he'd like to show me his fully kitted out GSF ships some time (since he had rolled a new alt with nothing to his name on the Red Eclipse to play with me), and when I asked where he kept his main it turned out to be the Ebon Hawk. It only seemed fair to roll up an alt there too. 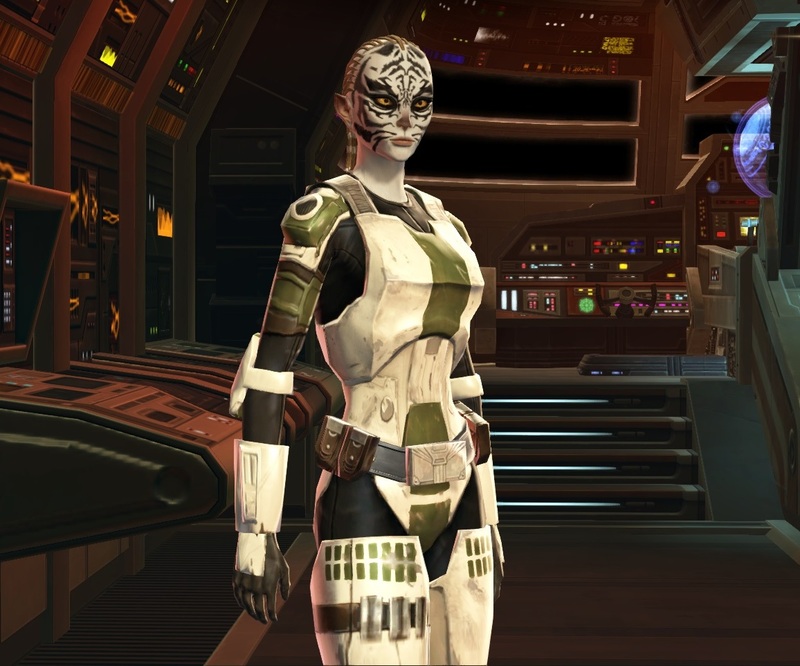 I decided to make another Commando, like my main, but I made her a Cathar since I don't have enough of those yet. I was both pleased and shocked to find that the name "Shintar" wasn't taken yet after more than four years... it seems to be available pretty much everywhere except on my home server. I quickly found myself familiarising myself with the outfit designer - I wasn't keen on it at all on release, and on all my high-level characters that were already at a high level before its introduction I've stuck to wearing orange shells, but on a lowbie that starts with nothing, even I have to admit that the outfit designer offers a cheap and simple alternative for maintaining a good look, especially while levelling. I still think it's kinda clunky in some ways though - for example I keep trying to save items into an outfit while I'm wearing them, but apparently you can't do that so I keep having to take things off and putting them on again whenever I want to make changes. Once I got Aric, I also stole his clothes since they don't make for a bad outfit and are not actually bound to him anymore. 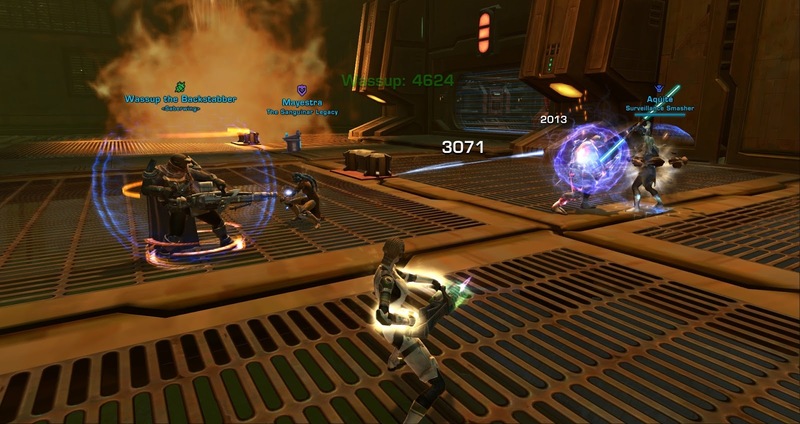 I decided that it had been way too long since I last did all the side quests on Republic side and had a go at them. Unsurprisingly, I was once again too high for the Esseles before I even got to the fleet so that I soloed it for the fun of it (on tactical mode that is, the actual solo mode is kinda boring). I spent a lot of time on the fleet in general and mused on how that is the place where you really "set up" a new character or legacy: buying a stronghold, choosing crew skills, picking up the various quests that introduce you to group content and PvP, and so on and so forth. Initially I was a bit taken aback by how dead the server seemed, but then I realised that I was playing at something like 3 am local server time, which was hardly fair. Eventually I still managed to get into one of each "play mode" to complete the various introduction quests: one PvP match (a Voidstar, which we won), one GSF match (which we lost and during which I played terribly, failing to get a single kill) and one random flashpoint (for which I got Cademimu, which pleased me, and everyone was polite and competent). In general my impression of the server has been a positive one so far, living up to the good old mantra of RP servers being better places in terms of community... even if there was some unnecessary discussion of American politics in general chat. I kind of wanted to go "stop talking about American politics already" but then I realised, well... this is a US server. Politics are always a bit annoying when people feel the need to discuss them in MMOs, but I find it particularly grating when people are way more focused on other countries than on their own. Couldn't really accuse anyone of that here though. Since I'm doing all the quests as well as group content on top of it, my character hit level thirty before I'd even finished Coruscant. Level sync for the win! 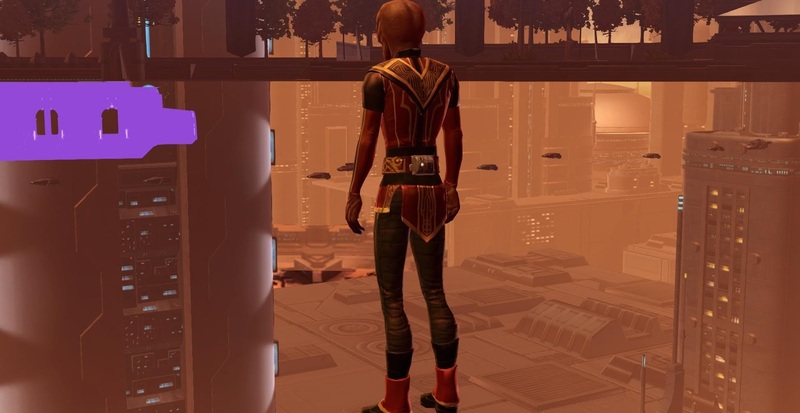 I need to write a post about the side quests on Coruscant some time; they gave me a lot of food for thought. 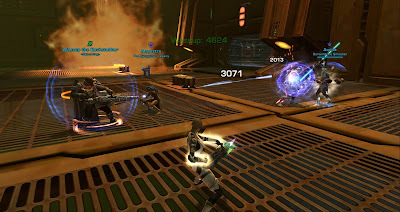 The only thing I didn't like is the lack of quality control (what a surprise) that was performed when they made changes to lowbie quests for KotFE. For example there is this mission which has two senators talking and which used to be in a somewhat remote room where it was easy to miss. This was moved into the main hall to be more obvious, which I approve of in principle, however nobody seemed to check what moving them to a different room would do the cut scene animations! So now one of the senators walks off into a wall and then floats around in space for a while. WTF. I also joined a pug for the Coruscant world boss and learned that apparently you can't be summoned by a guild ship if you don't have your own ship yet. Who knew? Woah. You can't be summoned by a guild ship if you don't have your own yet? You sound almost sarcastic there!